How much proof do we need before a majority of the population is willing to face the fact that we are all being sprayed with highly toxic elements from the ongoing climate engineering programs? 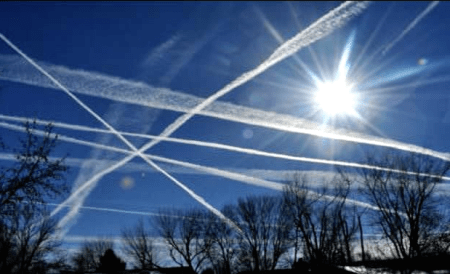 Those in power long ago made the decision to subject all life to the unimaginably massive and lethal global experiments of “stratospheric aerosol geoengineering” (SAG), and “solar radiation management” (SRM). Over the course of decades populations have been programmed and conditioned to accept the commercial aircraft “condensation trail” lie. 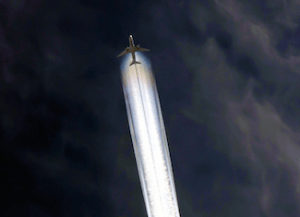 Though short lived true condensation trails can, of course, occur under extreme conditions (much more often with specific types of jet engines like the “low bypass” units that are standard on fighter jets), the “high bypass” jet engine (standard on ALL commercial carriers and ALL military tanker jets) is by design nearly incapable of producing a condensation trail. Here we detail the discoveries we have made about the dispersal systems we believe are being used on Airbus planes. We focus on the Airbus A320 family, which include the A319 / A320 / A321. A380 planes also spray over the UK and we have images on a separate page. A380s use a slightly different system and we have no idea yet if that system is original to the design of the aircraft, but we do now know that the A320 family aircraft belonging to any of the participating airlines have been modified illegally for the purposes of spraying aerosols into our skies during flight. 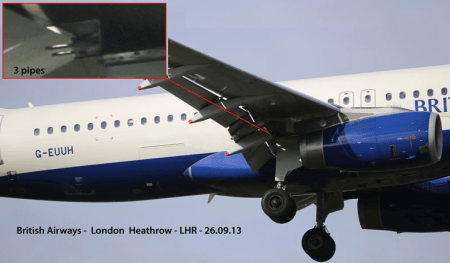 Our investigations started when we saw a single-pipe system fitted to a Ryan Air Boeing 737. Being based near Heathrow we went armed with long lenses and took about 100 images of planes landing, and sure enough we found the smoking guns as we now refer to them. Below are just 3 of the many images we have of these modifications. 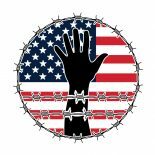 There is a host of disinformation online that has been produced since we started to publish these images. Rather than waste time trying to counter them, we spoke directly to Airbus. 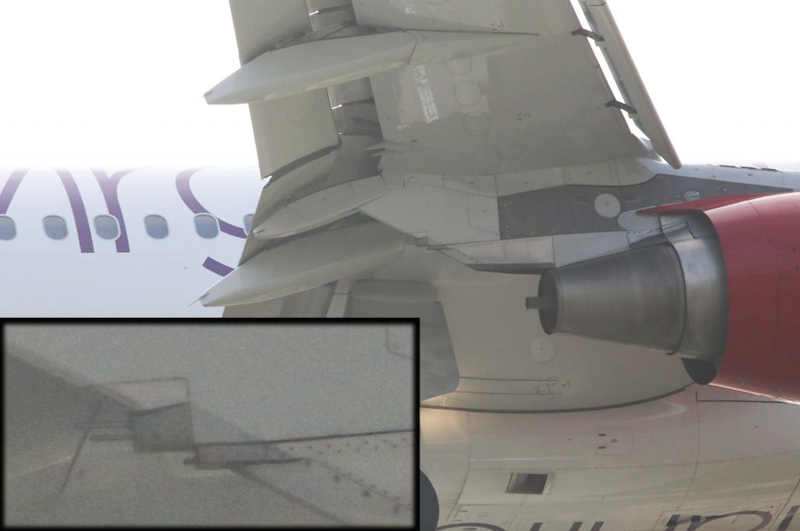 They confirmed in an email to us in August 2014 that Airbus A320 Family aircraft DO NOT leave the factory with any pipes in the pylon. Specification and design of our aircraft comply with certification requirements and safety practices to ensure that any potential draining need, linked or not to failure cases, will be adequately performed. 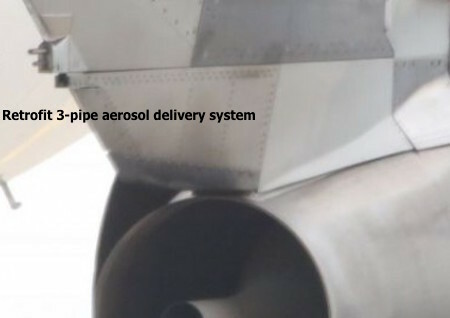 As such, Airbus A320 family aircraft have a fuel drain mast fitted as standard in the lower parts of the nacelle (and none for the pylons). It is an airworthiness requirement that any fuel leak must not pool within the aircraft structure to create a fire risk, must be drained away from the aircraft structure, and must be able to be visibly identified during the preflight safety walk-around checks. 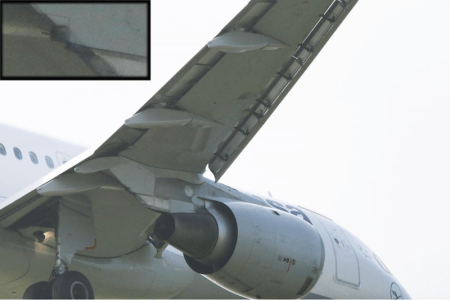 The nacelle fuel drain mast only serves to identify the very rare occasion of a failure where a fuel leak has occurred and, in the case of such detected failure, then the aircraft would be repaired before its next flight. The mast has no spraying capability, and is only used to drain aviation fuel, in the very rare case of a fuel leak. This entry was posted on December 11, 2015 by conspiracyanalyst in Chemtrails, Geoengineering, US News, Weather Modification and tagged Chemtrails, Geoengineering.